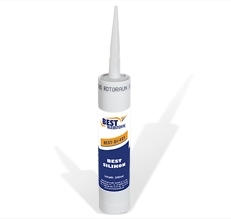 BEST-Silikon 401 is a one-component, oxime interlacing, permanently flexible adhesive and sealant based on oxime interlacing silicone with exceptional temperature resistance up to 300°C and high bonding strength. BEST-Silikon 401 is the standard product for permanently elastic and high temperature resistant bonding and sealing metals, ceramics, synthetic materials, glass, e. g. electrical appliances, electrical and electronic components, on furnaces and flue gas boilers. Fields of application: electrical engineering, electronics, tool manufacturing and mechanical engineering. BEST-Silikon 401 is of fast cure and of high strength, permanently elastic, chemical and temperature resistant after full cure. During polymerisation low doses of neutral and non-corrosive oxime are released. The cured product is free of odour and indifferent. BEST-Silikon 401 is ready to use and can be applied from the original container. If necessary extrude product and smooth adhesive surface with wet trowel. BEST-Silikon 401 is applied spot-wise or bead-like on a bonding surface. Assemble parts by using short, firm pressure. Skin forms after 10 – 20 minutes. The rate of cure depends on the ambient relative humidity. A relative humidity of 40 to 60% will lead to best results. Lower values may delay cure. Bonding surfaces must be dry, free of dust and grease as well as other contaminants. Sand-blasting, grinding and staining bonding surfaces will enhance adhesion on bonding surfaces. BEST-Silikon 401 features high resistance against weather and environmental influences, UV-rays, various chemicals, diluted acids, propellants and cleaning agents.